Harlan Punch with Florent Geroux aboard captures the 73rd running of the Louisiana Stakes at Fair Grounds. Harlan Punch ($8.60, $4.80 and $3.00) added another stakes triumph to his resume when sitting up close to the pace out battling a stubborn Silver Dust in the Louisiana Stakes at the Fair Grounds. Harlan Punch was making his second start for defending leading Fair Grounds trainer Brad Cox. Harlan Punch earned $45,000 from his win in the Louisiana Stakes which enhanced his career earnings to $749,058. He previously scored stakes wins in the Stymie Stakes at Aqueduct and Grade III Philip Islein Handicap at Monmouth Park for former trainer David Jacobson as well as the Veterans Stakes at Zia Park when under the care of Justin Evans. Completing the order of finish were Snapper Sinclair, Honorable Duty and Hawaakom. Harlan Punch was bred in Kentucky by Rosemont Farm. He is out of the Pulling Punches broodmare Indy Punch. John Mentz's Wynn Time put a short-priced bow on Saturday's Road to the Derby Kickoff Day presented by Hotel Monteleone stakes action at Fair Grounds Race Course & Slots when capturing his third stakes win of the meet in the Duncan F. Kenner. Trained by Hugh Robertson and ridden by Marcelino Pedroza, the Illinois-bred son of Three Hour Nap broke sharply from his outside draw in the field of six before conceding the lead to longshot Speightsong shortly after the break through an opening quarter in 23.33. That pace player quickly retreated after being challenged by the eventual winner into the turn, as Wynn Time regained the lead through a half-mile in 47.12. He was then able to repel a late challenge from Randy Exelby et al. 's Greg Foley-trained Control Stake, who was close throughout and narrowed the margin late under Ricardo Santana, Jr. while falling a neck short at the wire. It was three-quarters more back to Satish Patel's James Baker trainee Balandeen, who was head-and-head with Wynn Time through much of the stretch under Florent Geroux before settling for third. Wynn Time completed the six-furlong trip in 1:10.78 while winning for the eighth time in 11 lifetime starts. The $45,000 winner's share increased his lifetime earnings to $324,820. He paid $2.80, $2.20 and $2.10 as the 2-5 post-time favorite, with Control Stake returning $7 and $4.20, and Balandeen paying $2.80. Colonelsdarktemper, Kowboy Karma and Speightsong completed the running order. 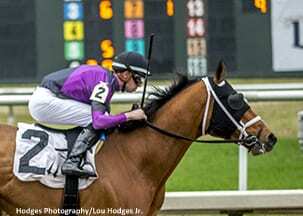 This entry was posted in Racing and tagged brad cox, duncan f. kenner stakes, fair grounds, Florent Geroux, harlan punch, Harlan's Holiday, hugh robertson, louisiana stakes, marcelino pedroza, three hour nap, wynn time by Press Release. Bookmark the permalink.